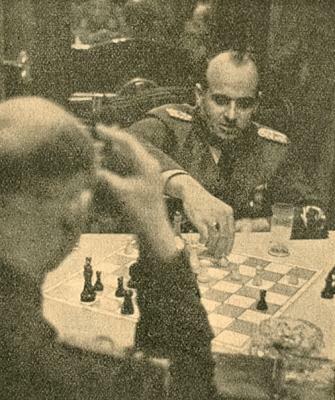 Some information about Hans Frank (1900-46), the most prominent Nazi leader to be strongly interested in chess, is available in the books on Alekhine by P. Morán and L. Skinner/R. Verhoeven. Here, we begin by giving a series of photographs of him, i.e. a selection from those published in Deutsche Schachblätter (1936-41). 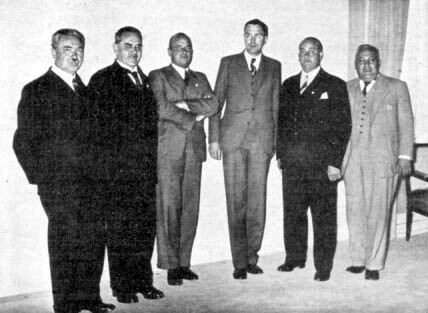 The caption identifies those sitting as (from left to right) ‘Zander, Frau Dr Aljechin, Reichsminister Dr Frank, Dr Aljechin, Richter’ and those standing as ‘Schlage, Post, Miehe, Helling, Sämisch, Oberstaatsanwalt Dr Bühler, Landgerichtsrat Dorn’. 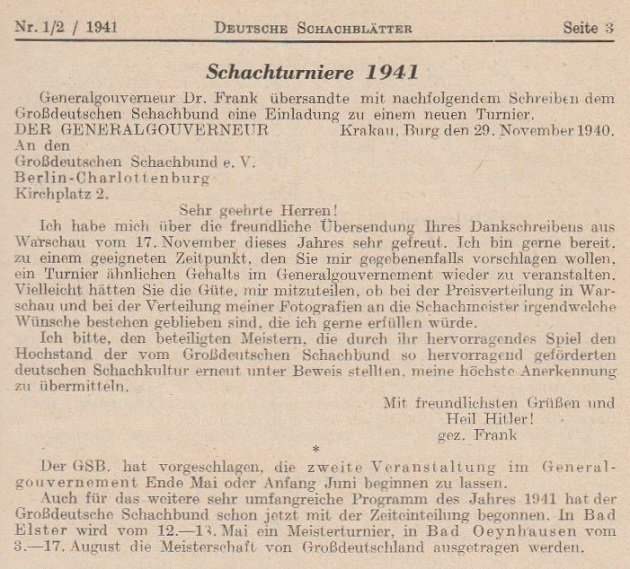 Deutsche Schachblätter ceased publication in March 1943. 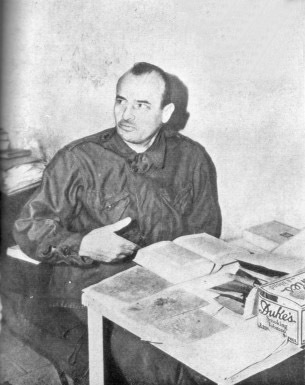 In Nuremberg on 16 October 1946 Hans Frank, having been convicted of war crimes and crimes against humanity, was hanged. 1 e4 e5 2 Nf3 Nc6 3 Bc4 Nf6 4 d3 Bc5 5 Nc3 d6 6 Be3 Bb6 7 Qd2 h6 8 Nd5 Be6 9 Nxf6+ Qxf6 10 Bxe6 Qxe6 11 Bxb6 axb6 12 a3 O-O 13 O-O f5 14 Qe2 f4 15 c3 g5 16 Ne1 g4 17 f3 h5 18 Kh1 Kf7 19 Nc2 Rg8 20 Rae1 Qf6 21 Nb4 Ne7 22 Nd5 Nxd5 23 exd5 Raf8 24 c4 Rg7 25 d4 Rg5 26 dxe5 Rxe5 27 Qd2 Rxe1 28 Rxe1 Re8 29 Rxe8 Kxe8 30 Qe2+ and Sämisch’s offer of a draw was accepted by the Reichsminister. 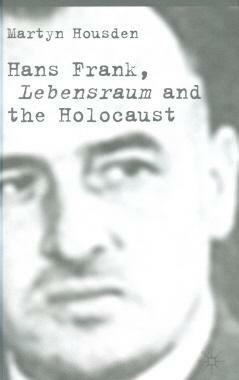 From 1939 to 1945 Hans Frank kept a diary, 11,000 typewritten foolscap pages, comprising 38 volumes [or 43 volumes; see C.N. 5533], and some of the material has been published over the years. 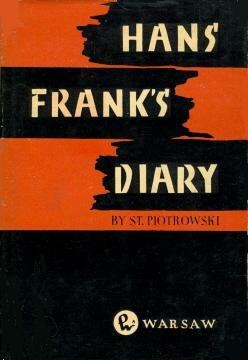 One such publication (from which the above statistics are taken) is Hans Frank’s Diary by S. Piotrowski (Warsaw, 1961). It is a 320-page book, but the diary excerpts do not begin until page 207. 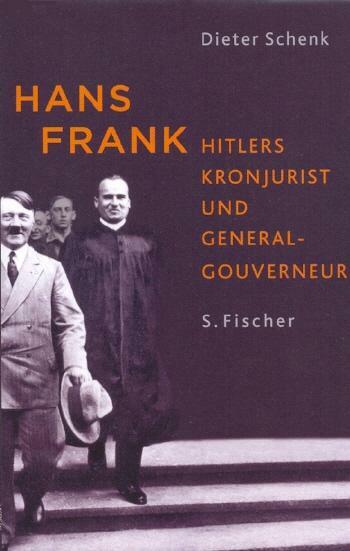 No references to chess have been noted, but we wish to ascertain whether Frank’s complete Tagebücher did ever mention Alekhine, Bogoljubow or, more generally, chess under the Nazi regime. Has the matter ever been investigated by, in particular, Polish or German chess researchers? We also have the longer edition Dziennik Hansa Franka by S. Piotrowski (Warsaw, 1957). ‘Frank was extremely interested in chess. He not only possessed an extensive library of chess literature but was also a good player, and he even “received” the Ukrainian chess master Bogoljubow at the castle. 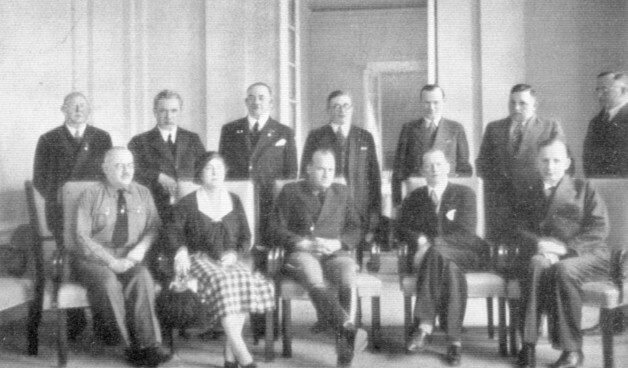 On 3 November 1940 he organized a chess congress in Cracow. 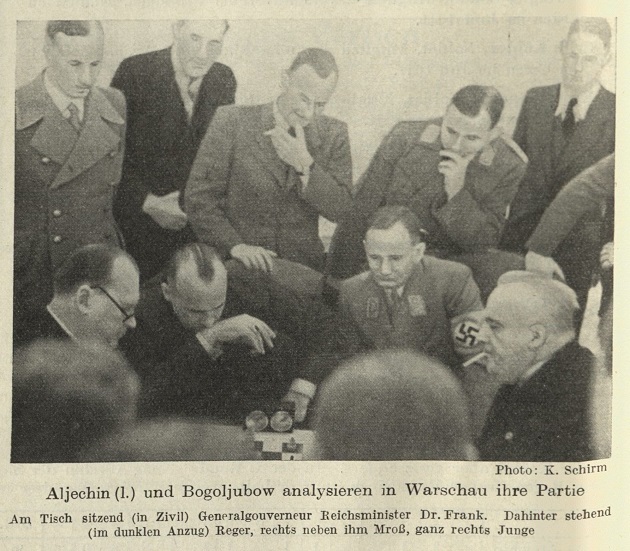 Six months later he announced the setting-up of a chess school under Bogoljubow and the chess master Dr Alexander Alexandrovich Alekhine, and he visited a chess tournament in October 1942 at the “Literary Café” in Cracow. 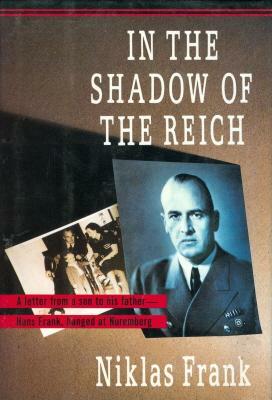 The Goebbels quote comes from his diary, and in an endnote on page 443 of the book the exact source is specified as ‘Goebbels Tagebuch, Teil II, Band 5, 21.8.1942’. 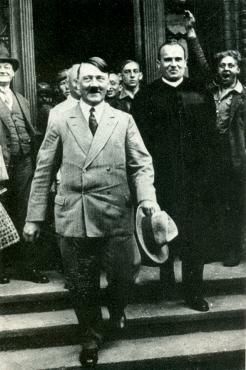 ‘My last meeting with Nimzowitsch was also the longest. 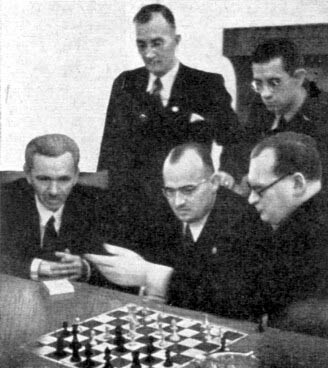 It took place in 1934, when we were both following the second Alekhine-Bogoljubow world championship match as reporters. 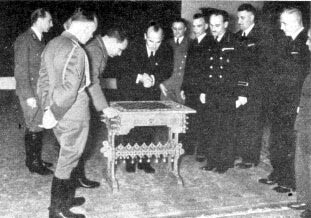 The games of the match were scheduled to be played in many parts of Nazi Germany – unfriendly territory for a Jew and not particularly safe for a Gentile either, in view of the tensions immediately preceding Hitler’s bloody purge of his political enemies, among them Ernst Röhm. Nimzowitsch considered himself protected by three consulates: the Latvian because of his birthplace, the Danish because of his residence, and the Dutch because some of his reports were going to a newspaper in Holland. 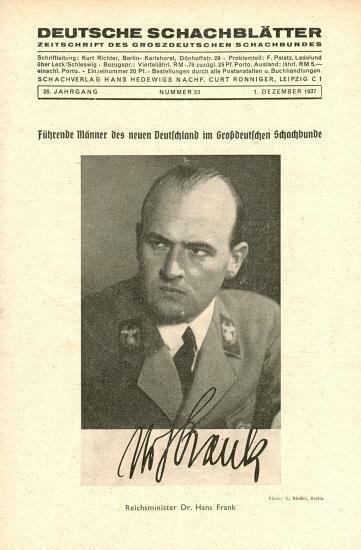 He boasted of this protection even to Reichsminister Hans Frank, who at that time was in charge of the “protection” of art and later became the governor of Nazi- occupied Poland. Frank followed a few games of the match and sometimes chatted with the masters and reporters, including Nimzowitsch. He even invited the whole chess troupe to his villa for lunch. 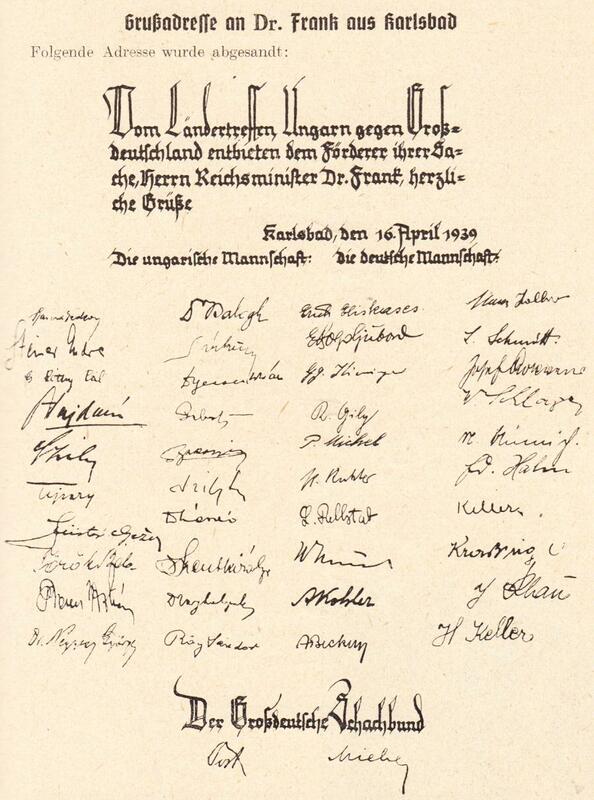 The Jews Mieses and Nimzowitsch were included in the invitation, but only Nimzowitsch showed up. At the luncheon he demonstrated his usual persecution mania by complaining first about a dirty plate and then about a dirty knife. 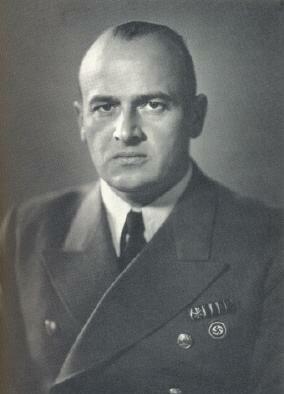 The Reichsminister, seated directly opposite him, pretended not to hear. If any reader has Nimzowitsch’s reports on the 1934 world championship match we should be grateful to know whether they contain points of particular interest. 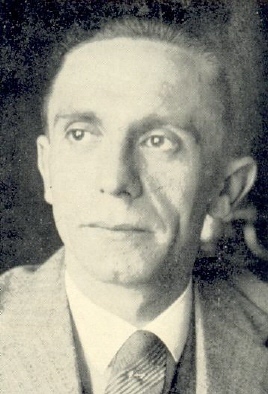 Olimpiu G. Urcan (Singapore) notes on a Dutch website a better version of the photograph (above) which was given in C.N. 5533. The participants in the match included Barcza, E. Steiner and Vajda (Hungary) and Eliskases, Bogoljubow, Kieninger, Gilg, Michel, Rellstab, Richter and Heinicke (Germany). 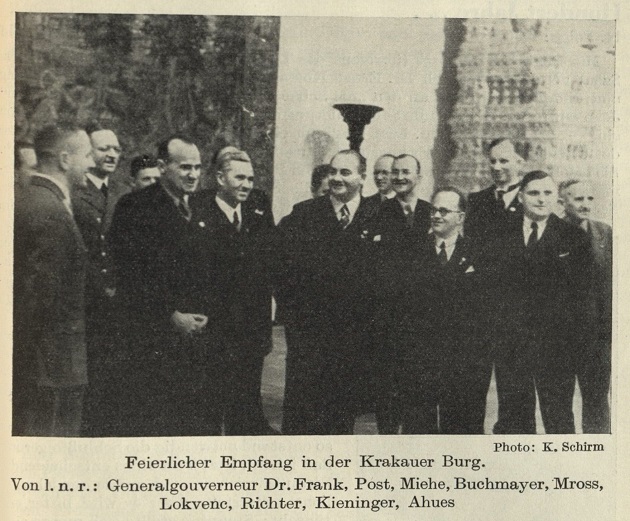 Deutsche Schachzeitung, November 1941, page 162. Latest update: 28 March 2017.